"It's about a race war and it happens in Florida. And the Jewish people sit in trees. And the black people are run by M.C. Hammer. And the whites are run by Vanilla Ice. I wanted to write the Great American Choose Your Own Adventure novel." - Harmony Korine, addressing a national television audience, 10/17/97 Back in print from Harmony Korine, 'A Crackup At The Race Riots' was originally published by Mainstreet / Doubleday in 1998. 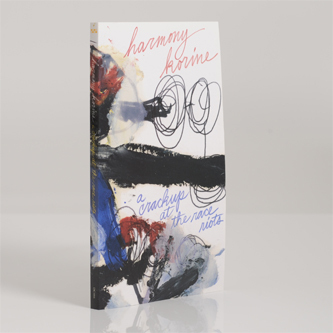 Korine's first novel presents fragments of a portrait in multimedia: print, photographs, drawings, news clippings, handwriting, a poem, attempted diagrams and clip art, but mostly text, including hard luck stories, off-and-on-colour jokes, script scraps, found letters, free rhymes, drug flashbacks and other missing scenes, exploring the world of showbiz with fingers prying in the cracks and feet set lightly in the black humours of the real old world. This excretion of the danglers of public life would make William Burroughs sigh and turn the page, at least. 'A Crackup At The Race Riots' also includes some other semi / attempted / quasi lists / scripts, a few letters from Tupac and a set of eleven suicide notes with room included for your signature. Harmony Korine is the self-educated thirty-nine-year-old who wrote and directed the controversial films 'Trash Humpers', 'Mister Lonely', 'Julien Donkey-Boy' and 'Gummo'. His new film, 'Spring Breakers', was nominated for the Golden Lion at the Venice Film Festival. Korine was raised in the carnival and lives in Tennessee with his wife and kid. "The new heir, the man, the sweet edge of the future" - Jim Carroll, author of 'The Basketball Diaries' "I was struck from the very beginning that there is a totally independent and new voice in writing. I believe that [he] is a great talent as a writer" - Werner Herzog"